Hello again all! You know, one of the many great parts about being an illustrator is the sense of community one receives with other illustrators and designers. I recently reached out to my illustration advisor in undergrad, Seo Kim, and had the chance to interview her on her craft. Seo is an excellent instructor, and she has a true passion for illustration and today’s industry that is unmatched. Her work pushes digital boundaries and maintains an organic sense of beauty and representation. So I received my undergraduate degree from Savannah College of Art and Design in Illustration and my MFA in Illustration Practice at Maryland Institute College of Art. I taught illustration as an adjunct professor at MICA after graduation which led me to my current position as assistant professor and area coordinator of the illustration department at Towson University. Alongside teaching, I am also a freelance illustrator with a focus on children's books and editorial illustration. What tools do you use to create your work? I primarily use Photoshop to create my illustrations. Within Photoshop, I gravitate towards pastels and graphite combined with custom "stamp brushes" that I create with handmade textures. I draw on a Cintiq and Procreate on an iPad. How do you manage your time to brainstorm, produce work, and meet deadlines? My teaching schedule is set in the beginning of each semester. So I try to leave designated studio time aside for days I don't have to teach or perform administrative duties. I would say it's about a 60:40 split between teaching and illustrating. I am very deadline oriented, and I'm pretty aware of how much time I need to finish an illustration, so I just get things done by staying in my studio until it's finished especially when things are on a tight deadline. What drew you into the illustration industry? I think it was only natural? I've always liked drawing as a kid, and I really like drawing for a specific purpose, whether it's for a client or to communicate something. Plus, it's always nice to draw for a living. How did you get your work published? I didn't necessarily prepare/produce a picture book dummy during my MFA thesis, but my images gravitated towards a children's market. I signed on with an agency fairly soon after I received my MFA degree, and my first picture book was acquired through them. Do you have any advice to give to aspiring illustrators? Generate work consistently! This is probably the hardest thing to do when you first graduate or enter in the freelance industry. Also, using social media for self-promotion and targeting local businesses is probably the easiest and most effective way to get jobs in the beginning. Sometimes results don't happen immediately, but try not to get discouraged by this so quickly. Sometimes perseverance and diligence can be a better quality to have as an illustrator than sheer talent. We’re about a month and a half into the new year, 2019. Sorry I couldn’t post last month, we were so busy in the Student Activities office here planning all kinds of events for our students who were around for the winter semester. But anyway, I’m excited to see what this year has in store. So far, I’ve been doing a lot of drawing and sketchbooking (which is a huge part of my brainstorming process, I will devote an entire post into that eventually) as well as trying to beat my writer’s block and work on my middle grade novel, one sentence at a time. I’m also taking an online class this spring about the young girl’s coming-of-age novel, the Bildungsroman- a German literary term basically translated into a novel of formation and education. We have to read about fourteen books, among them Little Women, Daddy Long Legs, Harriet the Spy, and more modern depictions of the girl’s novel of education like Fangirl and Brown Girl Dreaming. As you can imagine, it’s a fair amount of reading and conversing with my online classmates, plus we have to write a long essay and give a presentation closer to the end. But I love challenges and I find I perform better when I have a few things going on, so no complaints from me! As for other goals for the year, I’m encouraging myself to be more bold and step outside my comfort zone. I’m a naturally shy, reserved, Type B person who loves living by herself. It’s a breath of fresh air for someone who has always lived with others to have her own place, I can stay up late and blast my music and sleep in the cold without worrying about disturbing anyone. But I’m attempting to branch out a little more and maybe do stuff I would normally say no to. We’ll see how this goes, check back in on me to make sure I’m okay. I also hope to travel a little more this year. Again, we’ll see how far I get because I am in graduate school and I do work here, so it will be difficult to find time around my commitments. But I feel like writing and sharing my goals holds me accountable, so I hope to garner something out of 2019 that I might not have had in 2018 or in years past. I’m ready to jump into the rest of this great start to the year, and I will keep sharing content with you all as I move forward. Image courtesy of Alexandria LaFaye. Hello everyone and I hope you all had a Happy Halloween! This fall I am taking my first online course, an English Genre Study in the Craft of Writing for Children class called Writing in the Spirit of Things (how fitting in time for this Halloween post). In it, my class has read picture books, poetry, articles, and novels that deal with spirituality in children’s literature. It has been a unique experience, getting to know my classmates and professor online and reading texts that deal with these abstract themes. My professor, Alexandria LaFaye, is a children’s book author and English professor here at Hollins during the summer and at Greenville University in Illinois during the school year. Her work focuses on historical fiction and the essence of family. I speak with her in this interview to get to know her outside of my online class and to hear from her what it’s like to write children’s books. When I started elementary school, it only took a few hours in my kindergarten class to realize I was a complete and total geek. My thirst for knowledge lead me out of the room when the teacher discussed something I knew already (I went to the end of the hall so I could talk to passing 6th grades. They knew a lot), I dressed myself and had a singular fashion sense (think, no one else would wear that but her), and I talked to myself all the time—when I played, when I did art, I was constantly telling stories. So when it became clear that the kids in my class were going to haze me for being a weirdo, I wanted to do something that would inspire them to get to know the real me, figuring they’d realize I was weird, but fun. My thought was that if I could become famous, they’d want to get to know me. Becoming a famous child in a pre-Youtube era was a tall order so I went to the source with the most famous people I could think of for some inspiration—The Guiness Book of World Records. In it, I found a girl, Dorothy Straight who published a book when she was six. I was eight at the time, so I figured I was behind already and I started working to become an author. It took another 20 years before I was published, but wonderfully, in that time, I learned to be happy with my geeky self-regardless of how others responded to me and began to write because of how much I loved it not because I wan’t fame. What drew you to work in the children's book industry? Perhaps it’s because of the challenges of childhood, I’m not sure. I didn’t so much as choose to be a children’s writer, so much as the stories that I wanted to writer were for child readers and their families. I love to write books where the adults are as complex and compelling as the children because it’s more realistic to how life actually is and it makes the books more accessible as family reads. You write children's books and also teach children's literature courses at the college level. Is it difficult for you to balance these positions as well as set aside family time? Indeed it is. I’ve learned to carve out writing time writing retreat-style breaks every so often, ironically, I’m now on sabbatical and I could write every day and I’m finding that quite difficult because it’s so different from my marathon writing sessions. The demands on my time mean I’m not the most organized professor and I take more time than I should to grade papers, but I do my best to be present and engaged with each of my students and challenge them to continue to grow. The same is true for my family. I guard my family time because they are the most important people in my life and they deserve the best of me. Is there a particular genre you find yourself revisiting as an author? I’ve always loved history, so I return to historical fiction a lot. People need to learn the value of history to inspire us, to know where we came from, and to learn from our collective mistakes as a human society. On the other hand, I love to try new genres. I have a written in a quite a few fusion genres as well. Each time I write a new book, I try to set a new writing challenge for myself. It makes me a better writer and a better writing teacher. Pretty Omens, a novel-in-verse we read in class. Image courtesy of Alexandria LaFaye. Do your book ideas come to you naturally, or do you find yourself researching a subject then choosing to write from that? My ideas come from what if style questions and learning new things. Creativity is often described as the recombination of known things in unusual order, so the more you know, the more you can create and imagine. I knew about the Orphan Train which brought New York City orphans out to families “out west” from the 1870s to the 1930s and I wondered what would the story be like if it was told from the perspective of a boy who had an orphan “replace” him due to an injury that make it impossible for him to work. That question lead to the novel Worth. Your book, Pretty Omens, is a historically-set novel-in-verse. What did you find most challenging when writing for this genre? An upcoming picture book by Alexandria based on the real Nicodemus town in Kansas. Image courtesy of Alexandria LaFaye. Creating poetry that stands as poem vs. lyrical short-lined prose and finding ways to create a rich narrative experience that can be created by seeking out the story within the poems, between them, and as they stitch together in a larger narrative. Interestingly, when you write a novel-in-verse this way, a lot of people used to a more narrative style of novel-in-verse aren’t fully comfortable with the extra work my approach takes to construct the story. Even the most accessible poetry requires readers to build more of the story off the page than narrative prose. I actually love that about poetry, but for some readers, that’s too much work. What do you find is the most rewarding part of being an educator and writer for the children's book industry? The most rewarding part of being an educator is when you see a student recognize the value of what z/s/he has learned, but it’s even more amazing when you talk to that students when they’re no longer students and realize that they’ve applied what they learned with you in their own work and inspired those they work with—it’s an amazing interconnection among people who may never meet. The power of knowledge to transform is an amazing thing to behold and I’m honored to be part of that process. So for the children’s book industry—so many of the people in the field are dedicated to building community and support each other, committed to inspiring life-long readers, creating transformative literature, diversity, equity, and social justice. They’re my kind of people and I’m so thrilled to be a part of it. You can find Alexandria LaFaye on her website at alafaye.com, her blog, and on her Facebook page, and look out for her upcoming picture book, Follow Me Down to Nicodemus Town! Hello everyone and anyone that cares to follow along here. I’ve survived one full month as a graduate assistant here at Hollins University. For those of you that don’t know, I work here year-round in Student Activities office to help out with my MFA in the Children’s Literature department. I have a quaint apartment on campus all to myself, and I must say, it’s kind of nice being on my own. It’s been some time since I’ve had some solitude, and I’ve forgotten how much I’ve missed it. When I first moved here, I was so afraid of living alone and having to start over. For me, it’s a lot of work to meet people and get connected in a certain place, but over time, I’ve found friends on and off-campus, and I’ve even managed to plug into a local church. I’ve taken the time to appreciate where I am, in the middle of a valley in the Blue Ridge, and I really enjoy being here down south. One early morning last week as I was driving, I looked out my window, surrounded by the outline of the mountains, listening to a great Alt station I found, and was filled with a deep sense of pride in myself for cultivating this sort of new stage in life. It’s not easy to move on and do something new, at least not for me, but here I am. I’m proud of myself for that. Earlier tonight, I talked to a Photo Booth vendor helping us out with a theme night my office does in the dining hall on Fridays. She was telling me how she recently graduated high school and is now currently stuck in this inbetween moment of her life where she’s not sure what she wants to do with her future. I told her it’s hard to decide what you want to do, especially if you’re not sure what it is you love yet. But then I offered her a piece of advice my dad gave me. Try stuff. Do things. Sure, those are vague statements, but I believe they hold a great amount of meaning. You won’t know what you do or don’t like until you try it. You won’t meet people by sitting on the couch each night, and you certainly won’t get anywhere if you aren’t willing to do some exploring. Sure, I miss home, and even being here on a college campus makes me miss my undergraduate friends and career, but I often take a step back to run through a few reminders. I’m here studying what I love and I’m trying new things. I’m meeting people, and it’s not as difficult as the introvert in me initially thought it would be. On a more comical side note, when I introduce myself, most people here take an interest in my last name. It is a smaller town, and I guess there aren’t that many Italians, at least that’s what my dad suggested. So here’s to continuing this year with more surprises and wonder. Each day is a blessing in itself, so I’ll look forward to making the best of them. My very first semester in the Children's Literature Graduate MFA at Hollins ended last month, and I still can't believe it! The whole summer flew by so fast, and I am grateful to have made friends with my peers in the major. I also had the chance to meet some incredible instructors and visitors, including our Visiting Illustrator, Shadra Strickland. I had heard of Shadra through my undergraduate illustration classes- one of my professors is a friend of hers, and Shadra teaches at Maryland Institute College of Art (MICA), which is very close to my alma mater. It's always special to meet the people you've heard of, especially in the children's book world. During her weekend visit to Hollins, she lectured on her career in children's illustration, sharing details of her education and background. The following day, illustration students were invited to participate in her Linocut workshop, which explored layers and color in a traditional illustration medium. All in all, we enjoyed meeting with Shadra, but I wanted the chance to learn even more about her experiences in the children's book industry. From her debut work as an illustrator in the award-winning Bird (2008) to her recent journey as a children's book agent, I speak with Shadra to get to know her process and interests as an illustrator in the children's book industry. Meeting up with Shadra at Hollins University during her summer visit. I studied design, illustration, and creative writing at Syracuse University, but decided that illustration was where my heart really lied. After I graduated from college I became a substitute teacher which led to a full time position as an art teacher with Atlanta Public Schools. It was there that I started reading picture books to kids. That led me back to New York to pursue my M.F.A. in illustration at the School of Visual Arts. After many years of hard work and rejection, my big break came at an impromptu meeting with an editor at the Society of Illustrators Original Art Show. Picture books made sense to me because it combined all of the things that I enjoyed - storytelling, design, art, and kids. As a working illustrator, educator, and children's book agent, what does your work schedule look like? I keep pretty standard work hours in the office. I’m up at 7 to walk the dog and get a run in. I try to work from 9-1, take a break, and then finish up from 2-6 or so. When I’m working on a picture book, the hours extend into the evening. My role as an agent is flexible. I respond to submissions on Fridays, but I talk to clients whenever they need me. Sometimes we chat over the weekend if we’re developing a story. During the school year, I teach three classes a week. Classes are six hours long, so when I’m teaching a morning class, I get into the studio in the evening. It’s harder for me to work at night, but I try to stay disciplined and get at least a few hours of work done on school days. Teaching evening classes are a bit better because I can be in the studio in the morning before going in. My summers are devoted to being in the studio full time and squeezing in a few vacations here and there. It is becoming more difficult for me to squeeze in school visits and appearances, but do try to get at least 5 in throughout the year. I’m always interested in artists’ routines. There’s a great audiobook on Audible titled “Daily Rituals: How Artists Work” by Mason Currey. 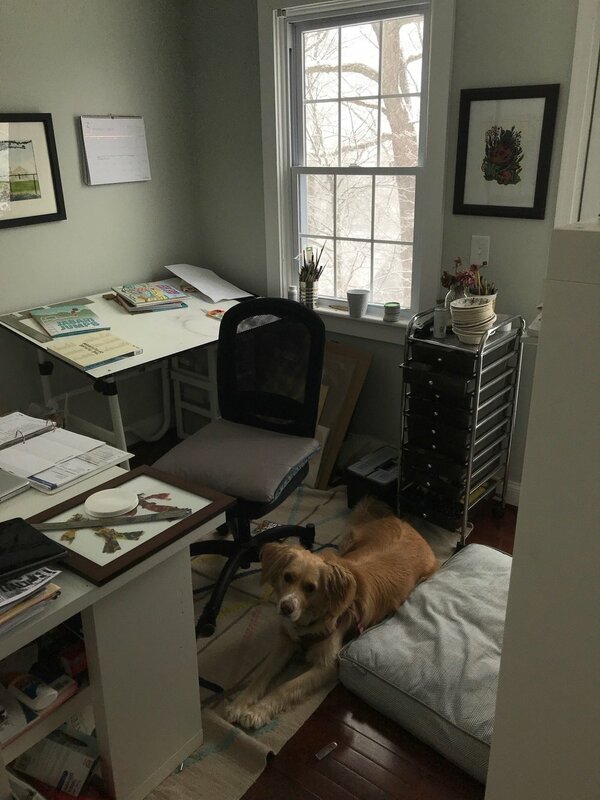 Shadra's studio space in Baltimore, and her sweet dog, Lucky (image courtesy of Shadra). You work in a variety of mediums. Do you have a favorite one, or is there a certain reason you choose to illustrate books with different tools and techniques? I really enjoy watercolor, watercolor dyes, and gouache, but I tend to switch media based on the story I’m working with. Each book has a different voice and different emotional weight. With water based media, I tend to render more and play with pattern and light, which works well for stories that are more rooted in reality, but for a book like A Child’s Book of Prayers and Blessings, the challenge was to find a technique that would make me simplify forms and communicate with shape and color - printmaking was the best solution. The other simpler reasons that I work in multiple mediums are I’m an artist, I’m curious and always looking to play, and lastly, I paid a lot of money for art school so I want to use all the tools that I invested in. Other than the story itself, what inspires you and your illustrative process? I’m also inspired by other artists. When I lived in New York I always visited galleries and museums. Art is everywhere. I’m influenced by other artists as well as inspiring sights and sounds in the world around me. I also try to travel to source ideas and inspiration for projects. The act of doing so opens doors to the creative process the I would never have accessed by looking at pictures on the internet alone. What do you find is the most rewarding part of being an illustrator? It may sound selfish, but honestly being able to put my talent to use is a huge reward. I’m not an art for art’s sake kind of person. For me, the motivation is knowing that others will appreciate and find some small joy in the work that I do. Outside of that, being in such a wonderful community of talented people is like being in an elite club of art superheroes. Check out Shadra's website, jumpin.shadrastrickland.com and follow her on instagram @shadrieka. Hey there! I have been super busy with grad school. As it turns out, there is quite a lot of work, plus I am a summer assistant to the head of the program, and I've been running all around campus for that position. But I like being busy, it keeps me on my toes and it keeps my mind buzzing. I actually find that I get much more done when I am busy. Since I have so much going on here at school, I haven't driven my car that much. That means I haven't been able to listen to the radio, or my playlists. Usually I find new music through alternative or rock radio stations, and I had my go-to's back in Maryland. Without my chance to consistently listen to the car radio, I haven't really had the opportunity to find music here yet, but hopefully I will very soon. I don't have time for a long blog, and while I don't have a very long playlist to share, here's just a few songs I've been listening to while I'm drawing. Check them out! A small part of the beautiful Hollins' campus. It all started about two years ago in my Writing Poetry II class (part of my undergraduate English major). The professor talked to the class about our futures in writing and showed us a website that pinpointed all sorts of advanced writing degrees and programs throughout the world. It was through this database that I found Hollins University, a small college in Roanoke, Virginia offering a graduate degree that I had never seen before. I scoured the university's website for details on the Masters of Fine Arts in Children's Book Writing and Illustrating, the only graduate degree of its nature to exist in the United States. My childhood dream of being both an author and an illustrator was reignited. Today, I am in my first week of the MFA. I still can't believe I am a part of a program that seems like it could have existed only in my fantasies, let alone one state below my hometown. Classes range between writing/reading and art. We discuss notable past and present children's books and their respective authors and illustrators, noting their significance on the industry. Of course, texts studied are not all picture books as the children's book market is a broad category that encompasses chapter books, the YA novel, children's poetry, and graphic novels. Other than the courses offered, I enjoy learning more about my fellow students. Everyone in the program (both students and professors) hails from a different state/region. Earlier this week for move-in, people arrived from places like Illinois and California, Texas, Maine and New Hampshire, Louisiana, Oregon, Colorado, Kentucky, Maryland, Vermont, Arizona, Massachusetts, Rhode Island, and even other countries like South Africa and Scotland. I love seeing these people from all sorts of areas come together for 6 weeks to learn and discuss the art of children's literature. Most of the students in our small but tightly-knit class are like me, aspiring children's book writers and illustrators, while others are teachers and scholars wishing to instruct the arts at a higher level. We are blessed in that our special program occurs only in the summer, from mid-June to late-July. Because of this, administration is able to recruit published authors and illustrators as well as editors and scholars, where they may take time out of their busy schedules to sit with us students and offer feedback on our portfolios and manuscripts. It's been quite a journey for me so far as I have never truly been that far from my home- during my undergrad, I was about 40 minutes from my parents and house. Here in Roanoke, I am five hours away, and in another state. But I am still so glad just to be here learning with likeminded individuals. This MFA in Children's Book Writing and Illustrating is something I have been interested in since the day I was introduced to it, and I can only hope and pray that it will lead to me being a published author/illustrator of children's books. Back in mid-April, I made my sister go with me to see Isle of Dogs. It's Wes Anderson's latest film, a stop-motion animation, and it was beautifully made, although there was no doubt in my mind going in that it would not be (also my sister enjoyed it). For a little background, I love movies. I love watching movies, going to the movies, listening to movie soundtracks and scores, and reading about film production. But Wes Anderson is my favorite director. In fact, three of his films, The Royal Tenenbaums, Fantastic Mr. Fox, and Moonrise Kingdom, are my all time favorite movies. He has an incredibly distinct style, and it's so evident that you don't even need see his name- branded in Futura font, another Andersonian distinction- roll through the opening credits to know immediately that it's one of his films. From knolling (look it up, it's a technique you'll recognize it immediately) to symmetrical compositions, flat camera moves, zoom-in shots, and slow-motion walking sequences, I love that all of his films have these overarching filming elements that belong solely to him. These similarities fall under his directing umbrella, thus making him an auteur, something I admire. I also like how he incorporates a heavy use of traditional art and design, be it through stop-motion animation, incorporation of art and paintings (I'm picturing the ones in Royal Tenenbaums), hand-lettered type (his later films have seen less of Futura), classical architecture, fanciful costumes, miniature models, and practical effects and sets. In terms of plot and storyline, I find his themes involving youth and age, familial dysfunction, betrayal, and teamwork to be relatable. And his recurring actors and actresses he's cast throughout his body of work also adds a sense of community. As artful and character-driven as his films are, I believe Wes is the type of director who does not take himself too seriously as each film he makes is sure to include dry humor and wit along with ridiculous scenarios the main characters must maneuver. He mixes melancholy with simple comedy. A lot of my art friends admire Wes; I suppose it's because of his unique and recognizable style, and we've all been taught in art school that it is crucial to develop your own style in order to make and sell work. Wes is someone we see as novelistic and successful in film and art, and not in a flashy, mainstream, blockbuster way. I admire his inclusion of art and familiarity. I listen to his film soundtracks because they include both classic rock songs and dreamy scores, my favorite sounds to listen to when drawing. The writer in me wants to emanate his infusion of nostalgia, humor, and seriousness in plot. When I write, I think about how life can be a strange concoction of sadness, sweetness, beauty, silliness, and zaniness. I think Wes Anderson's directing technique is specifically designed to incorporate those exact elements, and perhaps that's the main reason I love his work. Reading is so vital in building up our knowledge and worldview. It uncovers our interests and distastes. It takes us to faraway places and brings us to familiar surroundings. Reading introduced me to areas I have come to cherish. As a child and even now, I love spending time at my local library, looking up new books in the catalog or simply thumbing through the librarian's recommendations on the shelves. Traveling inside a book can offer a sense of adventure, or it can teach us something new. My grandfather, for instance, often finds a particular subject or time period he wants to know more about. He will then devote himself to it, reading several books- all by different authors, to said subject just so that he can get a wide enough perspective. I find myself liking the same subjects, often works of fiction involving young protagonists (favorites include Because of Winn Dixie, To Kill A Mockingbird, and The Invention of Hugo Cabret), but college has helped me expand my interests. While I could go on and on about all the books I love, I'll just leave you with recommendations of what I've recently read. If you like fluffy fiction, I recommend Minnow by James E. McTeeer II. I actually read this novel twice, it has beautiful imagery that transports readers to the wild South Carolina island landscape in which it is set. This story too is heralded by a child protagonist, a boy who must find medicine for his sick father while navigating mysterious terrain. If you like period pieces, detailed descriptions that focus on setting, and minimal dialogue, this is a good book for you. I often look up the publisher of the books I read, especially if they are not well known. My curiosity for this book led me to Hub City Press, an independent publisher based in South Carolina that focuses on place-based literature, specifically stories set in the South. Check out their other titles at hubcity.org if you are interested in setting-heavy books. Thanks to a book assignment on The Glass Castle in college, I have become obsessed with memoirs. I think one reason Jeanette Walls' story is so successful and why it has been on The New York Times bestselling list for so long is because humans are naturally drawn to rags-to-riches success stories. For those of you who, like me, are drawn to tales of resilience and are looking for a book similar to The Glass Castle, I recommend Hillbilly Elegy by J.D. Vance. His memoir draws on more political themes associated with working-class Appalachia. Vance, a Yale graduate who grew up in the Rust Belt, describes his tumultuous family life and the grandparents who raised him. I laughed out loud while reading some of Vance's memories, and it's an incredible rarity for me to show any visible emotion while reading. I highly recommend this book to anyone looking for an eye into a part of America rarely seen by outsiders. If you are interested in physical labor, construction, carpentry, and women doing all the above, you should read the memoir Hammer Head: The Making of a Carpenter. In it, Nina MacLaughlin recounts her decision to leave her desk job in pursuit of an ad in the paper looking for a female carpenter. Inspiring and concise, you should read this if you've been watching too much HGTV and want to know what it is actually like to build physical objects like walls, tables, and counters. Other house and decor-inspired reads I recommend is Junk Gypsy by Amie and Jolie Skies and Salvage Style by Leslie Linsley. The former is the the story of two Texas sisters responsible for creating a junk-centered empire along with their design tips and step-by-step found-object crafts and projects. It functions as a sort of mish-mash book, including recipes, DIY projects, and biographical elements. The latter, published under Country Living, offers advice on salvaging furniture and accents and mixing styles from the past with the present. Both books have savory photography to match the writing, so if you need visuals, look no further. I hope to share more books I have recently read and recommend on more blog posts. For now, I'll sign off with this, read as much as you can! It's always good to learn, and I truly believe if people read from a wider variety of styles, genres, and authors, they would be more informed, better educated, and more understanding on all sorts of subjects. I thought I'd share some of the music I listen to, specifically my winter 2018 playlist, which I can't stop replaying. Music is so integral to my art-making, it inspires my illustrations and my writing. I mostly listen to today's alternative and rock as well as classic rock. What I listen to can be so special, and even though it's only music, I think sharing it with others and hoping they receive as much as I take from it makes me feel good. Here we go, my first playlist share post! Hello readers! As part of my endeavors to learn more about the children's book market and the commercial art industry, I will be starting a new segment on my blog, interviews! These exciting new blog posts will feature various illustrators, writers, artists, and creative minds and how they make their work. I will also be talking about their respective industries, highlighting the current demand, and discussing any advice they might offer. My very first interview is with children's book writer and illustrator, Eliza Wheeler. After seeing her first book Miss Maple Seeds and flipping through the colorful pages filled with charming hand-drawn illustrations, I connected with Eliza for a school assignment. While that first meeting was about two years ago, I have since revisited our discussion for this interview. Eliza focuses on traditional illustration with some digital touching-up and illustrates (and sometimes writes) picture books like Miss Maple Seeds and This is Our Baby Born Today along with creating covers and chapter illustrations for middle-grade novels like Doll Bones and Spirit's Key. She has also won awards from the Society of Children's Books Writers and Illustrators (SCBWI). I went to the University of Wisconsin-Stout to study graphic design, and my school required many studio art classes as well (drawing, painting, etc). I worked in the graphic design field after college, doing in-house and freelance jobs. I began pursuing illustration on my own, and started attending SCBWI conferences and workshops. I have no formal training in writing or illustration, so everything I've learned comes from independent study, attending conferences and workshops, and also through experience. What technologies (if any) do you use for your work? I work primarily with traditional drawing techniques, using a lightpad to trace sketches onto the final watercolor paper to be painted, once they've been approved. For some projects I use some digital collage, so will use a scanner, wacom tablet and photoshop for that kind of work. When and how often do you write, illustrate, or make art? When are your deadlines? What role does time/time management play in terms of your work? I typically illustrate 5-6 days a week, for 8-10 hours a day. I've had frequent deadlines and have been juggling many projects for the past 4 years, and am beginning to slow the pace down later this year so that I can focus on one thing at a time, and commit time to work on new projects of my own. I'm also looking forward to experimenting with new techniques again. Where do you like to write and illustrate? Is there a specific place you have to do your work? I've just moved to a new home in a new city, and for the first time I have an entire studio space to myself! It's very exciting. It's a sunroom with nice big windows. I also like to work in coffee shops for sketching or writing. Why do you write and illustrate? Because I love visual storytelling -- because I love ink on paper and watercolor washes. I love chasing an image that I have in my head and trying to translate it onto paper. Finding new ways to compose an illustration is always exciting. How do you create your work? Are you inspired or methodical in your process? I start with a story (sometimes mine, usually someone else's), and begin looking for inspiring images from other artists as my bouncing off place for coming up with new ideas. Many illustrations often involve reference photos as well, gathered online. Then I create rough thumbnails, and gradually go from small loose sketches to larger, more detailed sketches. I trace my sketch onto final drawing paper, and then ink and paint it. My process is methodical because my work is for clients who want to approve sketches before the final piece is begun. I attended SCBWI conferences, revised my illustration portfolio, and my portfolio was eventually chosen for a mentorship critique at the SCBWI National Summer Conference. One of the mentors was Cecilia Yung, art director at Penguin Books, who invited me to submit picture book dummies to her. I created a picture book dummy for a story idea I had, sent it to her, and she liked it enough to share with her editor, Nancy Paulsen. Nancy Paulsen contacted me about the dummy, gave me suggestions on how to improve it -- which I did, and resubmitted it to her, and she offered me a book contract for that story, which eventually became MISS MAPLE'S SEEDS. I got an agent after getting that first book contract and have had steady work in children's publishing (so far) ever since. For more on Eliza and her work, visit her website, wheelerstudio.com and follow her on instagram @WheelerStudio. A small view of an aquatic stage bursting with color. I was six years old when my neighbors, a boy my age and his older brother, introduced me to a new cartoon show about a happy-go-lucky kitchen sponge living in a subaquatic pineapple in a town populated by colorful undersea characters. That show would become a large part of my childhood, and it has long since been a source of my humor and imagination. Even now when I rewatch an episode, I can't help but chuckle at some goofy quote or ridiculous visual pun. On a Saturday night this December, my best friend (also a fan) and I returned to Bikini Bottom, in person. When I heard SpongeBob Squarepants was being made into a Broadway musical last year, I was immediately intrigued but soon confused as I learned the show’s director was making the conscious effort to portray SpongeBob and his nautical friends in human form. I decided I had to attend the show, which just opened on Broadway Monday December 4th of this year. Between the performances of the incredibly animated actors, who each had their own unique and mellifluous singing voice that best suited their character, the creative costume design, and the stunning found-object sets, I felt as though I had swam through the ocean and discovered Bikini Bottom in its vibrant whimsy. What made the musical so stunning was its expressive use of detail. The actors costumes’ had a suggestive tone of their cartoon counterparts, from SpongeBob’s suspenders and plaid pants, Patrick’s pink and green Hawaiian patterns, to Sandy’s cut afro and pinned flower, which ingeniously alluded to her deep sea cartoon bowl helmet. On stage, pool noodles became reef, stacks of boxes and ladders interpreted a mountain, and umbrellas floated like jellyfish in an enchanting undersea garden. The costume and set design demonstrated a mastery of nonsensical playfulness along with other inventive components to the show, like the construction of Rube Goldberg machines that framed the stage and interacted with both the actors and the audience. One of the most humorous aspects of the musical was the offbeat use of sound effects. A live Foley artist sat in view of the audience and used various instruments, devices, and all kinds of bells and whistles to accompany the movement of Squidward’s tentacle walk, Sandy’s karate chopping, and other funny motions. The sound artist also used drum-rolls to pair with lighting effects for certain cues and cutaways that often resembled the television show’s pacing. Without the added effects, a crucial part of the cartoon’s humor would be missing. Me and my friend Katie meeting Ethan Slater, SpongeBob himself! The colors and overall vision were enough to transport me to Bikini Bottom, but the personalities of the actors and their individual approaches to the popular television show introduced me to the characters, I felt a genuine connection to Spongebob and his friends. I have always enjoyed the zaniness and surprising wit of all the characters, though I will say that I naturally gravitate toward SpongeBob due to our optimistic similarities. The actor portraying my favorite sponge became the yellow character in human form, his ebullience and unbreakable cheer was the living embodiment of SpongeBob Squarepants and all he stands for. All the characters’ voices and costume designs, the vivacious settings, and the hilarity of the sound effects, use of lighting, and cartoon-esque cues were all necessary and inclusive to the musical's overall sensory appeal, the feeling was true to the television show. I want to thank the cast, the creative team, and the producers and directors for such a memorable show. For me, SpongeBob Squarepants The Broadway Musical, was not just an incredible theater experience, it was sentimental, a tender visit back into my childhood. Graduation is in sight. I'm about to start a new job. I'm finishing up an internship at a publishing house. But still I'm asking myself, now what? It's that dreadful question that brings me to this dreadful stage in life. As a young adult, I want to have that loose, carefree lifestyle associated with those first few years of college (though I was not much of a partier). Still, I liked the fun independence behind it- going to class, meeting with friends, playing intramural soccer, and not having to worry too much about adult responsibilities like deciphering bills and taxes, driving and paying for a car, and somehow finding a suitable job to keep up with it all. But young adulthood is dichotomous as I would also like to have that sense of maturity, knowledge, and confidence that I can handle whatever comes my way. Even though I have made progress on my self-esteem over the years, I have noticed that whenever I start something new, I respond with fear. Take the new job, for example. Whenever I start a new position, I immediately wonder if I'll like what I'm assigned to do, if I'll fail miserably and do a poor job, how long will I be there, is this really what I want to do/should do...The questions go on and on until they keep me up at night and before you know it, I'm dreaming about an unclear future. Not fun (or healthy, I suppose). It's almost like an instinct or a defense mechanism for me to try to understand what's going on so I can define it in my own terms. But I realize I'm not alone in thinking that being a young adult is in no way a cakewalk. It's a struggle for everybody, we're all trying to make our marks and find our places even though it's oftentimes strange and even frightening. Between entering the workforce, making ends meet, navigating relationships and finding "the right one," it's all very difficult for me to understand. Add to that, what I really want to do is hard enough- writing and illustrating books is an end goal, but until then, I have to support myself somehow until I can get to that point. My favorite verse in the bible is Matthew 6:34: "Therefore, do not worry about tomorrow, for tomorrow will worry about itself. Each day has enough trouble of its own." I grapple with this thought everyday but somewhere in the back of my mind I know that what God means is true and I hold onto it. Yes, I have many dreams, and while I do hope they come true one day, I should not waste my breath worrying about fulfilling them ASAP. I should be grateful for what I have and where I am in life, even though it seems eerie and unfamiliar. Then again, things aren't always what they seem. This past week- September 17th-23rd to be exact- I had my very first solo exhibition- Ideation: Imagining Children's Book Illustrations, in the Center for the Arts Building at Towson University. The art department accepts a few student spots in the building's Storage Space Gallery each semester, and this past spring, I showed the gallery coordinator my work, which was accepted for the fall's line-up of student solo exhibitions. It was an honor just to be accepted, but perhaps it was even more exciting to see my artwork in a public space. Some of the work in the show! I posted some flyers around the building advertising my exhibition, which was only a week long (it was scheduled this way so the coordinator could fit the other student week-long exhibits in the semester). I had a small opening reception Sunday, the night of the 17th, where my father helped me install my illustrations and sketchbooks and my mother showed up with pita chips, Mediterranean roast, and cupcakes. Other than my parents, my best friend Katie, her boyfriend Wes, and her mom Mrs. Sally showed up to cheer me on. It was a small gathering (as everyone I befriended in college had graduated that spring and were no longer around), but I was so grateful to have people that I am close with support me and my art. The rest of the week, other students (and even a class of freshmen who came in to take notes!) visited the gallery to see my work. While my child-friendly book illustrations in watercolor, oil, and digital paint were what stood out on the walls, I also had set out my sketchbooks- which are primarily made via collage and have darker and zanier themes - for people to see. I left a feedback journal for people to write me notes after seeing the exhibition, and as a takeaway, I left a stack of my business cards. A mini-series of forest animals. At the end of it all, I was pleased that my work had its time hanging in a gallery space. Now I have some feedback to look back on for uplifting words, and even though I don't know if/when I will ever receive a solo exhibit again, I'm glad I had an opportunity to show my work and let people pick my brain. You will learn soon enough that I am full of dreams, and while dream #1 will always be getting published- that is, having both my writing and illustration out there in the world- another significant dream of mine is to travel. Stopping (sans backpack) for some beautiful views on Hermit Trail inside of the Grand Canyon. I have a specific interest of seeing natural lands and the biomes that make regions unique. To zero that idea down even further, I have a particular pull to see all of the US national parks. While that is a hefty wish to fulfill, I realize it can be done. So far, I have seen three, my first being Acadia National Park in Maine on a family trip back when I was ten or so. I actually do remember the trip very well, it was incredible. We stayed in a cozy lodge and much to my delight, had the chance to see my favorite animal, a moose! My next national park trip would not be until this year, where my university offered a once-in-a-lifetime spring break trip of camping and backpacking inside of the Grand Canyon. I signed up on a whim and it was one of the best decisions of my life. The backpacking was strenuous and camping was not at all glamorous since Arizona is hot and dry even in March, and running water was not available at the bottom of the canyon (unless you qualify a few streams and the Colorado River), but that didn't mean much to me as I was over the moon to even be there. Me and my BFF Katie, goofing around at Big Meadows Campground in Shenandoah. Just last weekend, my best friend Katie and I decided to go to Shenandoah National Park in Virginia, which was also amazing (I don't really think you can go wrong with a US national park, unless of course you despise nature). The park itself is situated in the Blue Ridge Mountains, a range that is a part of the larger Appalachian Mountains. The name comes from the mountain's hazy shades of blue, I believe it has something to do with the chemicals the trees release, but nevertheless, in August, there were a bounty of green leaves and plants and from a distance, the mountains really did appear blue. Katie and I spent Saturday hiking Old Rag Mountain, the park's leading attraction, and while hiking, we came across two bears- one was digging, the other was eating berries (it was really neat to see them interact with the wildlife), a fair amount of ravens at the mountain's summit, and also a rattlesnake, which I almost stepped on while walking on the trail, but to be fair, I had no idea it was there and it didn't hiss, rattle, or make any noise even as it slinked off. She and I want to visit more parks together, which I am absolutely game for. We're planning on going South to see Congaree in South Carolina and Great Smoky Mountains in Tennessee/North Carolina next year. It's beautiful to see all of nature and what God has created for mankind. A couple of people I know that are into national parks want to visit them in one big road trip, which would make sense if you head out west where the majority of them are clumped together, just look at a map. One day I'd like to do something like that, but I also like the way I've been visiting them in special week-long or weekend trips. By travelling that way, I can really experience the individual park and not have my memories muddled together of all the places I've been. I'm glad I have my best friend as my adventure buddy, and hopefully in the future, my future husband (wherever he is) will be into US national parks, although if he's not, I'll be questioning why I'm married to him. I do wish I were situated closer to some of the parks; the nearest one from my current home is Shenandoah, and that was 3 and a half hours away by car, but again, the joy is in the journey, and I wouldn't mind road-tripping out west in an RV, van, or Airstream. It's a dream that'll come true with time, patience, and of course proper budgeting. As a writer and an artist, I take much of what I see and process it into my own understanding and perspective. A huge factor in my inspiration field comes from music, I couldn't live without it. So to anyone out there who knows me on a more personal level, you probably have heard me talk about The Beatles at least once, and even if I don't talk about them, there are still hints that I love them (posters, listening to them via laptop, phone, or car CD, singing in the shower, etc.). But I don't know if people quite understand why I love the Fab Four so much; it comes down to more than what the surface can show. The Beatles are undoubtedly the greatest band ever, but it wasn't until I've grown up that I realized why that is. As a kid, I remember taking long road trips to visit family, and in the car my mom would play the more recognizable Beatles songs from their greatest hits album. Over the years, I've become more curious about a wider range of their songs, and whenever I have a question regarding them, my classic-rock-loving mother is there to be my guide. I will say, if it weren't for her, I'd be finding a lot of the music I love much later, or possibly not at all. But on a more personal level, I find the reason The Beatles were so successful is within their innovation. In the 60's, they were pioneers for new sounds and new ways to explore music in the recording studio, and they were responsible for starting many things that are still used today. Think of the deep experimentation of infusing Eastern music into Western pop and rock. George Harrison was key to the band's involvement with Indian sounds (think "Norwegian Wood" and even more so in "Within You Without You"). Ringo Starr utilized drum hooks and beats that weren't loud or flashy, but instead memorable and everlasting (my personal favorite, his drum solo in "The End"). Orchestras and choruses were brought into songs like "A Day in the Life" or "Hey Jude," and other aspects of sound were brought into the studio, from animal noises (The White Album) to playing with tape loops and using unconventional instruments (Revolver). But perhaps what I find most significant to the overall artistry of the band is the Lennon-McCartney songwriting team. Their lyrics were and still are incredibly meaningful, especially for men under thirty, and they captured themes that are much deeper and contemplative than what many songs have. In other words, they didn't just write about the go-to theme of love and relationships, and even when they did, they did it with a sense of surreal beauty. I think I am so fond of their music because they have the perfect incorporation of sound and meaning, something that I look for in good music. I often listen to them when I'm creating something. I would have to say that my favorite album by The Beatles, even though it's hard to choose, would be Abbey Road. A lot of songs in the sequence bleed into the next one in this album, and I notice that is something many classic rock albums include; I think it's fantastic, it makes the songs seems like one long composition, creating a sense of connectedness. I wish albums of today would do that. I could ramble about The Beatles all day, and I'd probably end up talking about how magical it was for them to even be together, despite them being a band for only a decade. There is so much music out there that I find inspiring, there are a lot of creative minds out there, but what I think is most special about the musicianship of The Beatles is their ability to convey timeless messages in such an artistic, inventive way that really makes listeners think, and that's what I want to create in my work. Hello there and welcome to my online portfolio! While there is plenty of room on the site for my illustration and design work, I wanted to create a space that showcases my writing, and a blog seems to be the most suitable place. I am, after all, a writer and an illustrator. For me, words and pictures go hand in hand. As someone who writes, draws, and daydreams a lot, creativity and imagination are what inspire me to do what I do. Sometimes I wish I had talent in another, what I see as "more practical" subject like mathematics or science, where the focus is on objectivity and finding answers. Ironically enough, I do not always like subjectivity, I find it can complicate discussions and I miss the comfort of clear answers. But as complex and mystifying as the arts can be, I would not trade my skills and passion for it for anything else. So as far as this blog will go, it will act as a sort of journal for my at-the-moment thoughts, recent happenings, or nostalgic recollections (I have plenty). Usually my notes are full of fragmented dreams, a few unfinished stories, and lots of poetry, mostly bad poetry, but some decent poetry (but mostly bad). I keep a journal near my bed for jotting down quick thoughts I have; many of my ideas for writing come at night while much of my ideas for illustrating and making art come during the day (more on idea catching later, that's what the blog is for). I'll be updating my site on the basis, making art and squeezing in some blog posts, so check in if you think you are interested enough to hear what I have to say!